15. Thalictrum L., Sp. Pl. 544. 1753. Gen. pl. ed. 5:620. 1754, Boiss., Fl. Or. 1:5. 1867, Hook.f. & Thoms. in Hook.f., Fl. Brit. Ind. 1:10. 1872, Lecoyer in Bull. Soc. Bot. Belgique 24:78-324. 1885, Nevski in Komarov, Fl. URSS. 7:510-528. 1937, Qureshi & Chaudhri in Pak. Syst. 4(1-2):89.1988. Perennial mostly rhizomatous herbs with erect stems and alternate, 2-4-pinnatipartite leaves. Leaflets lobed or dentate, suborbicular to ovate or obovate in outline. Flowers small, with a simple calyciform, rarely corolla-l ike perianth. Sepals 4(-5), deciduous. Stamens numerous, longer or slightly shorter than the sepals. Carpels few to numerous, sessile or stalked, with persistent stigma. Style absent or strongly reduced. Achenes unilocular, 1-seeded fusiform to ± inflated or laterally compressed. The taxonomy of Tholictrum offers a considerable number of unsolved problems. It has not been the subject of any recent revision or monograph. Wh ile most of the species and its segregates are as puzzling here as in any other part of their large area of distribution. No subdivision beyond subspecies has been tried in the present account as no regional treatment can be satisfactory in this group. Represented by about 150 species of N. temperate and paleo-tropical, neo-tropical and S. African distribution. Represented in Pakistan by 11-12 species. Thalictrum chelidonii DC., Prodr. 1:11. 1824, Hook.f. & Thoms. in Hook.f., Fl. Brit. Ind. 1:11. 1872, Stewart in Ann. Catalogue Vasc. Pl. W. Pak. & Kashm. 275. 1972. This species is related to Thatictrum pedunculatum, from which it differs by the petaloid sepals which are lilac or purple and bulbils, present in the leaf axils. Type: C. Nepal, Wallich in 1819. A more easterly species distributed from Kashmir eastward to Bhutan, Nepal, Assam. Thalictrum fimbriatum Qureshi & Chaudhri in Pak. Syst. 2 (1-2):13. 1978, & Pak. Syst. 4 (1,2):100. 1988. According to authors this species differs from all other species in its fimbriate stipules and unisexual flowers. I could not examine the type specimen (Kashmir: Sharda, S. Iqbal & A. Abbasi, 1591, ISL). It is quite surprising that the authors assign it to the sect. 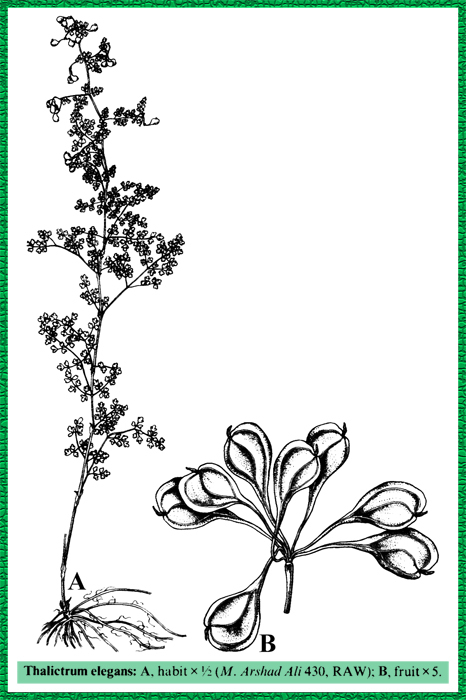 Thalictrum, characterised by sessile achenes which are cylindrical to ovoid. without h aving seen any fruit.